Marketing gurus say it costs 12 times the cost to acquire a new customer as is to maintain existing ones. I know, you have heard this countless time. But, this is worth pondering. Unlike offline stores where customers might walk in by hundreds, an online store receives traffic in thousands. Also, there is cut-throat competition. Even those who are working full-time day jobs are running an online store as a side hustle. So, the only way to stay in business and keep growing it is by retaining your customers. In today’s post, we will discuss how to retain your customers so that your competition does not eat into your market share. Even if you make signing up easier, you need to give your customers something more that will lure them to start shopping right away. 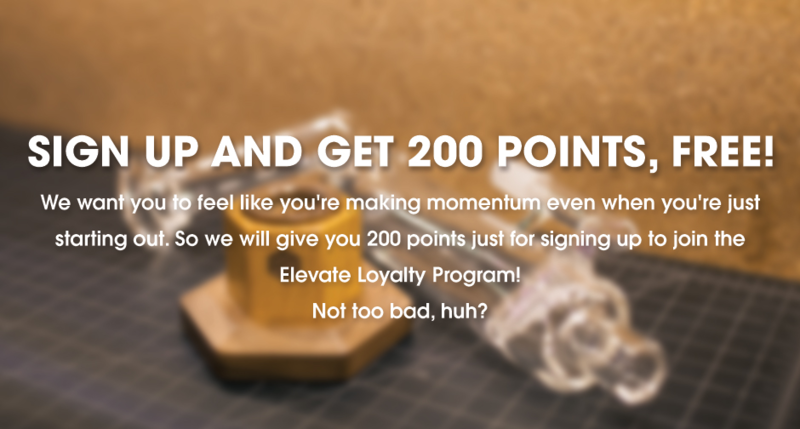 Loyalty programs or rewards for signing can do that task for you. 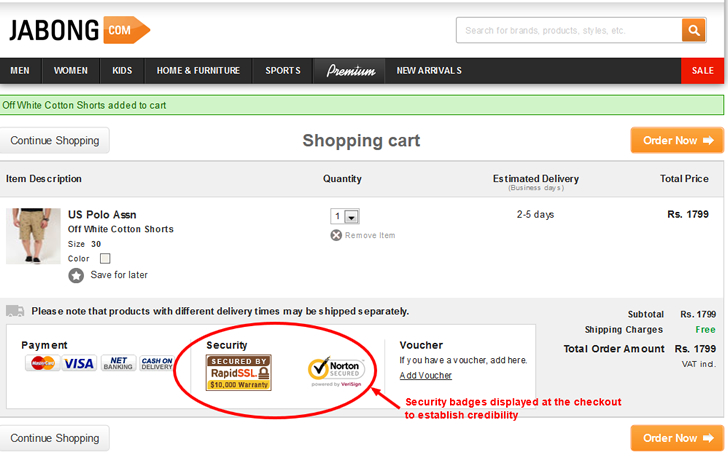 These loyalty points can be credited to the user’s account. The user when notified of the points credit will feel an impulse to spend it right away. 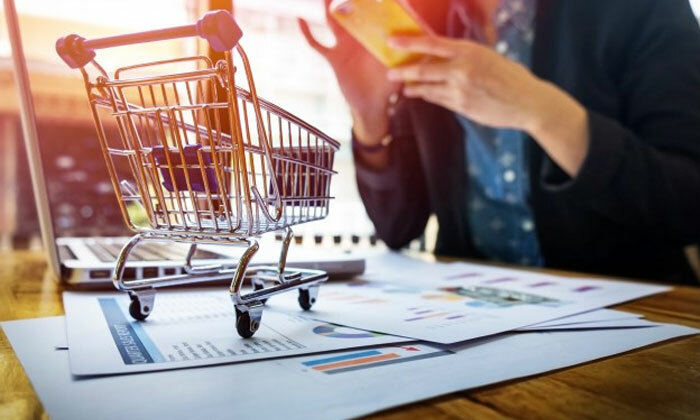 By customizing special orders or by using tactics like upselling or cross-selling you can make the customer spend on your store right from the first time they visit the store. Also, for every completed purchase, they can be credited more reward points. 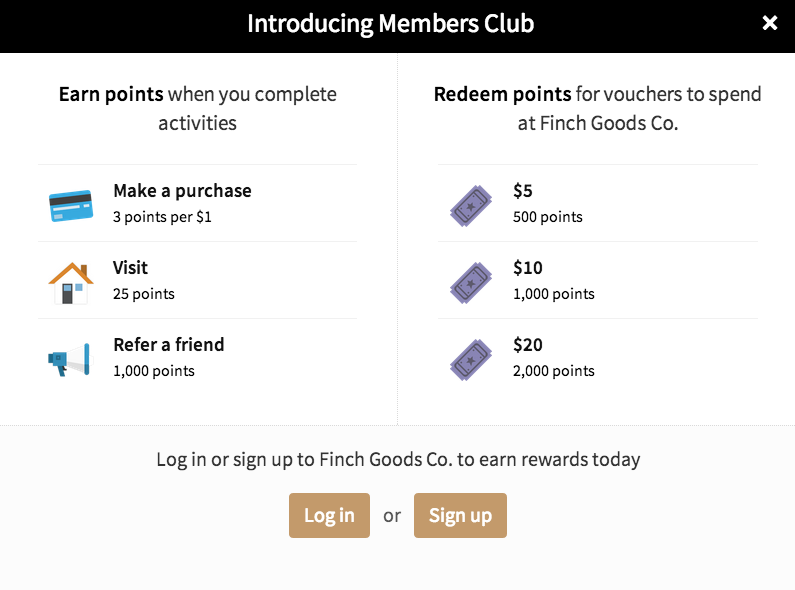 You may also reward points for referring new customers or spending more than a threshold amount. These reward points can be redeemed in the future for more purchases. In the end, your store will gain more conversions without losing much. There is hardly any cost involved since credits are nothing but discounts and concessions in another form. In marketing, there is something called Brand Recall Value. It is defined as the ability of the consumers to correctly elicit a brand name from memory when prompted by a product category. Think Apple when we think of smartphones. Audi for luxury cars. Disney for entertainment and so on. For online stores, creating a brand recall value is an uphill task since there is hardly any chance to meet or greet customers. It is here that newsletters step in as a viable option. Well-timed newsletters help nurture interest in customers. They keep reminding customers of their previous shopping endeavors with the website. 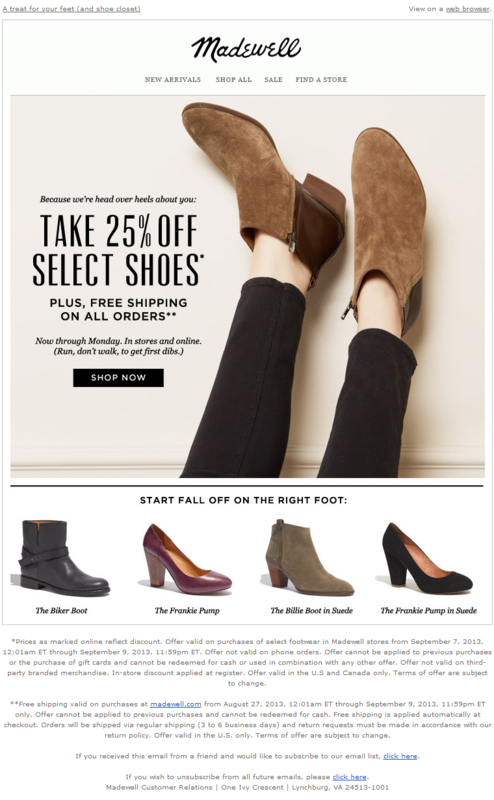 Here is a Madewell shoe newsletter that announces a special offer through an email newsletter. Upselling and cross-selling are natural ways to boost your store’s conversion rates. Be informed that up-selling and cross-selling are closely related but, are different mechanisms. Up-selling works by persuading the customer to buy a higher version or a slightly expensive products. For instance, let’s assume your customer wants to buy a pack of french fries. The usual pack might be priced at $2.50. If you are to offer the customer an additional 40% quantity of french fries, for a slightly higher price, say for $2.70, then the customer would be tempted to buy the extra pack. Cross-selling on the other hands works by bundling related or essential goods with selective goods. Online retailers call it bundling or combo packs and by other several inventive names. The underlying idea of cross-selling is that, if customers are offered another product, for which they might have a need, they are bound to buy it. Let’s take an example of a laptop. If you bundle a printed at a discounted price along with the laptop, there is a fat chance that customer would buy the bundle than the laptop alone. Ultimately, up-selling and cross-selling help improve the average cart value of your online store. Also, they keep customers loyal to your store since they are getting more stuff for the same money. The fear of online hacking and cybersecurity attacks lurks in the mind of every user. In fact, some visitors would stick to window shopping and prefer not to shop online fearing online payment security concerns. There is only one way that you can instill confidence in the minds of customers. By going the HTTPS route. HTTPS is the secured version of HTTP which ensures that the data shared between you and the customers are always encrypted. Install an SSL certificate on your website to make your online store HTTPS ready. In addition to HTTPS, you may also security badges and seals to show that your website is indeed secured by noted web security authorities. These security badges establish credibility that your site is protected from all corners that thwart hacking of any kind, especially the most common Man-In-The-Middle-Attacks. And customers who feel safe while shopping with your site will not look for any other online store. It is a proven to retain them for life. Retargeting emails are personalized, targeted towards a specific customer group and often carry a trigger that will make the customer take instant action. For instance, in the case of a customer who abandoned cart without completing the order, a retargeting email carrying a special offer for the item in the cart will make the customer buy it immediately. The same goes for items in wishlist too. Notifications for a price drop or upcoming deals will make the customer ready for a purchase. Also, they remain your customers for the long-term too. Do you know? 91% of customers would prefer to simply opt for another online store than raise a complaint. Such customers would rather spread the discomfort they experienced with your store through word-of-mouth to their near and dear than tell you. That is why setting up omnichannel customer support is a must. Omni-channel support ensures that customers are able to reach out for help through any medium. Social media, email, telephone, customer service portal and many other mediums can be brought under a single omnichannel support system. This would help quick redressal of complaints leading to better customer satisfaction. Satisfied customers are those who stick to your business forever. Got any more ways to make your customers stick with you for long? Let us know through comments. Happy selling!